Have you ever wanted to step off the planet for awhile and immerse yourself in a relaxed state and emerge feeling fresh and beautiful? Then SALON U is for you! 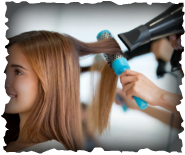 It is a stress free salon, offering scalp massages, hot towels, and dim lights over comfortable shampoo chairs with highly trained stylists who are expert in helping you create the perfect style. From a haircut that is like a custom-made garment that fits so perfectly, to expertly placed colors and magical formulations that create a look all your own. Straighteners, smoothers and permanent waves make your styling easier. 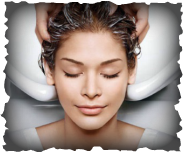 Treatments that heal and protect the scalp and ends help to make your hair its healthiest! 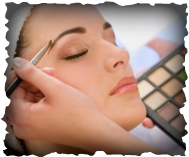 Facials, make-up, lashes and the perfect brows, give you a flawless finish so you can put your best face forward! At Salon U it is all about YOU, and we want you to have a beautiful and relaxing experience! We use Italian method hair cutting. It is based on cranial structure and face shape. This method creates a cut that is custom to your and grows in beautifully. All haircuts include a consultation, scalp massage, shampoo, finishing rinse, cut and style. The heavenly haircut is a step out of the ordinary and includes the art of brushing, exfoliating scalp massage, vitamin scalp treatment and deep treatment for ends, plus finishing instruction. "A look isn't complete until it's finished"
Your wedding is such a special event. We help you design the perfect style to harmonize with your wedding dress. To help create that magical look, we can add hair pieces, extensions, ornaments & hair jewelery. Our makeup service will complete the look. See our Bridal brochure for more detail. Bridal party group discounts available! We are famous for our formulations! Each one is created by custom blending tones that are most flattering to your skin tone and eye color. We use Framesi color. It is one of the longest lasting, fade resistant colors on the market, based in creamy coconut oil that helps protect and condition the hair. It really does feel more like a conditioning treatment than a tint. This is where we really shine! Take your color to a whole new place by adding dimensional tones in interesting places. Go lighter, darker, richer... There are no limits to the endless color combinations we can create for you. From straight to curly, curly to straight, or just luscious waves and smooth tendrils. Salon U will customize the texture you desire. Beauty isn't about looking perfect, it's about celebrating your individuality. Our Waxing Services, Facial Services, Makeup and Eyelash Services are customized to your unique individuality. We help you put your best face forward! Like a ten minute face lift. Brows have never been more important. They frame your eyes and make a statement. Flawless make-up begins with superior skin care. It's not a luxury, it is a necessity. The magic is in the application!